Waits at driver licensing offices are getting shorter, and hundreds of thousands of people a year are eliminating the wait altogether with a few mouse clicks on the DOL website. 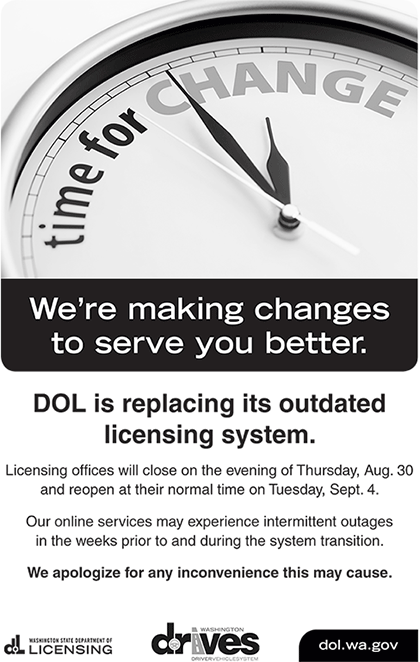 After 21 office closures or modifications and other additional budget cuts, DOL continues to add new services to its website. The latest, rolled out in September, allows people who have moved to change their address online. It’s required by law that the address is kept up to date. Drivers and ID card holders can go to dol.wa.gov to change their address, replace a lost or stolen card and get a copy of their driving record. Most people can also renew their driver license or ID card online every other time it is due for renewal. Haight says that the agency is on track to serve more than 500,000 transactions over the web in 2011, a dramatic increase from 120,000 three years ago. He says the web will help the agency simply keep up with the growing state population. The agency typically sees the highest customer volumes and office wait times during the summer months. This year, though, office wait times were significantly lower, averaging less than 30 minutes statewide. You are currently browsing the archives for the LSO closures category.